IP Monitor is a network address monitoring tool which allows you to be informed of IP address changes on a remote computer.This enables you to access a computer from a remote location, as you will always know when its address changes. Using IP Monitor you may track the internal and external network addresses for a specific machine. If a change occurs you may set up notifications by email or FTP updates. Keep track of changed addresses. ...... to it. It is also useful for dial-up users who are issued a different IP address each time they connect. IP Monitor can help you get access to a remote computer which has a non-static IP address. 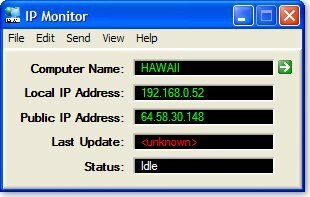 IP Monitor can display your external IP address. This can be different than the local/internal address if you are running on a network that has a router or firewall in place to access the Internet. Qweas is providing links to IP Monitor 5.1 as a courtesy, and makes no representations regarding IP Monitor or any other applications or any information related thereto. Any questions, complaints or claims regarding this application IP Monitor 5.1 must be directed to the appropriate software vendor. You may click the publisher link of IP Monitor on the top of this page to get more details about the vendor.